Jones was born in Marylebone, the daughter of Irene (née Isaac; 1911–1985) and Griffith Jones, an actor (1909–2007). Her brother Nicholas Jones is also an actor. She attended the Royal Academy of Dramatic Art, where she won the Gold Medal. Gemma Jones appeared at Nottingham Playhouse in 1965, as Anya, in The Cherry Orchard. In 1966, she played the great soprano Giuseppina Strepponi in After Aida at the Old Vic Theatre. Jones became known to television viewers after starring in the BBC serial Kenilworth (1967) as Queen Elizabeth I, and in BBC 2's 1970 dramatisation of The Spoils of Poynton. She was first recognised outside the UK in the mid-1970s, after playing the Empress Frederick in the BBC television drama series Fall of Eagles and Louisa Trotter in another BBC drama, The Duchess of Duke Street. In 1980, she played the role of Portia in the BBC Television Shakespeare production of The Merchant of Venice, opposite Warren Mitchell's Shylock. Jones played Mrs. Dashwood alongside Kate Winslet, Alan Rickman and Emma Thompson in the Academy Award-winning period drama Sense and Sensibility (1995). Her other notable roles include Mrs. Fairfax in Jane Eyre (1997) Lady Queensbury in Wilde (1997), Grace Winslow in The Winslow Boy (1999), Bridget's mother Pam Jones in Bridget Jones's Diary (2001) and Poppy Pomfrey in Harry Potter and the Chamber of Secrets (2002), reprising her role in Harry Potter and the Half-Blood Prince (2009) and Harry Potter and the Deathly Hallows - Part 2 (2011). From 2007 to 2008, she played Connie James in the BBC1 drama Spooks. She appeared in the Woody Allen film You Will Meet a Tall Dark Stranger in 2010. In 2011, she appeared in the BBC1 series Merlin, as the Cailleach, the gatekeeper to the spirit world. Also in 2011 she appeared in the Bridge Project's version of Richard III as Queen Margaret, alongside Kevin Spacey as Richard III and directed by Sam Mendes, at the Old Vic and subsequently on an international tour. She received the British Academy Television Award for Best Supporting Actress for her portrayal of Neil Baldwin's mother, Mary, in the 2014 television film Marvellous. In 2015, Jones played the part of Petunia Howe in the three-part BBC series Capital, based on John Lanchester's novel of the same name. ^ Noble, Peter, ed. (1982). 1982–1983 Screen International Film And TV Year Book. King Publications. ^ "Gemma Jones Biography (1942–)". ^ Radio Times, p.6, 10–16 July 1971. ^ Nottingham Playhouse. Programme, The Cherry Orchard. 1965. ^ "Ant and Dec repeat Bafta success". BBC Online. 10 May 2015. Retrieved 10 May 2015. 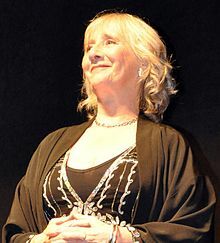 Wikimedia Commons has media related to Gemma Jones.